Poll: Do Investment Professionals Know about Impact Investing? Do investment professionals know about impact investing? We asked this question in our latest survey in the CFA Institute Financial NewsBrief. 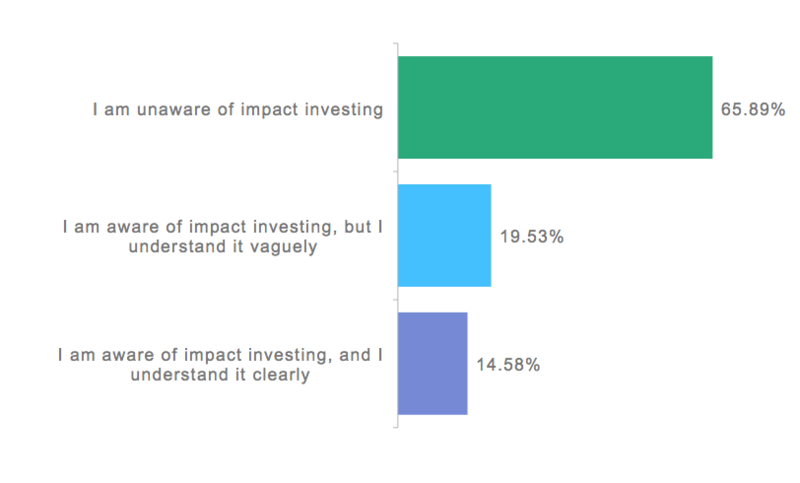 Poll: Which of the following statements best describes your awareness and understanding of impact investing? A clear majority of the 727 respondents are unaware of impact investing. Around 20% are aware of impact investing but understand it vaguely. That leaves us with only about 15% of respondents who think they are aware of impact investing and understand it clearly. Any thoughts on how to grow the number of investment professionals that understand impact investing? Spreading information like this is certainly a good start, but finding ways to prove the worth of understanding impact investing is really what we need. Thank you for the thoughtful comment Ryan Steinbach. I hope you also had a look at the short video interview, “An Introduction to Impact Investing,” and the blog post, “Impact Investing: Making a Financial and Social Return.” In the past, we have also covered other ESG and impact investing topics. We have some more content on impact investing in the queue and hopefully it will be published on this blog in the coming months. Please consider subscribing to Enterprising Investor blog (see bottom right) and you will receive email notifications about new posts. Perhaps a good start would be if the Impact Investing space could get over itself and start trying to attract and hire commercially minded, and proven, professionals from the traditional investing and capital markets space. It may be unfashionable to like big, bad, hairy bankers, but they would at least help give Impact Investing some structure, visibility, and corporeality. Otherwise, II is always going to lurk in the bottom of the drawer marked ‘alternative philanthropy’. From my perspective I will agree to differ with Andy Hill. Until very recently shareholders were purely individual or institutional financial investors and as such, the drive to attain Profit and Value Creation was done so to align with the interests of those shareholders i.e. financial gain. Today, there is a strong movement towards redefining who and what stakeholders are and many globally recognized companies have already added employees, the communities surrounding their businesses, the environment, their customers, vendors and supply chains as stakeholders. This of course is the first step in redefining profit and value creation so that it may be aligned with the interests of all stakeholders including financial stakeholders. I am a recovering banker and I think it is fair to say that the vast amount of profit and valuation creation on “The Street” is still aligned to financial shareholders. Furthermore, who says that bankers alone can give Impact Investing “structure, visibility and corporeality”? There are a myriad of extremely bright and competent leaders (many of who have been hugely successful in their past careers – including finance) working in and promoting sustainable investing (grouping ESG, SRI, Impact Investing etc together). Finally, I had a ring side seat for the incredible growth and subsequent implosions in and of some sectors of the financial markets including the ABS market and the way many of the bankers involved acted was certainly not with a view to sustainability. So I will agree to differ and state that in my opinion bankers in general (of course there are a number who have a passion for sustainable investing for the right reasons) are not the answer. The answer is to remove greed from the equation, develop a consumer/citizen sustainability/conservation based revolution that votes with its capital and lifestyle to force governments and corporations to become more sustainable. If we all worked upon making the personal spaces we inhabit a little more sustainable; if we all chose to only invest in securities of companies with high sustainability ratings or funds that use sustainability screens to pick their portfolio investments; if we all chose to buy goods and services manufactured, distributed and sold from or by companies with high sustainability ratings we would effect the size of change required to make a difference. Sustainable investing and linking it to sustainable conservation is not a passing fad, it is growing and it is here to stay. Engaging tens of millions of citizens/consumers and helping them ebed sustainable practices into the fabric of their lives will be the catalyst to as sustainable future and we do not only need bankers to do that.